If your insulation is beginning to fail, it is letting air out of your home envelope, creating more work for your furnace and air conditioning systems. This inefficiency will leave your home a little less comfortable and your wallet a little thinner. Start by looking a recent energy bills. Do you see a slow rise over the past few months? This may indicate that your insulation is becoming less and less effective as it wears over time and that your heating and A/C systems are working much harder to keep your home at a comfortable temperature. Compare your current energy bills with last year’s bills in the same time frame so that you know whether it’s the energy usage itself that’s making your bills go up or just a fluctuation in energy prices. Another indicator that’s easy to measure when assessing your insulation is just looking and feeling. Insulation should feel soft and malleable. If it crunches and crumbles, then it may be time to think about replacing. 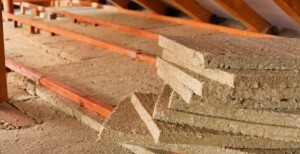 It’s especially important to assess wear and tear in your basement insulation. If there has been a lot of snow melt or rainfall, it’s likely that your insulation got wet and could be molding. Pests in your home are another catalyst to wearing down your insulation. If you’ve had a pest problem recently, it is important to check the insulation for eggs as well as spots where the insulation has been eaten through. These signs of wear and tear may seem trivial now, but if not taken care of can cause many problems down the road. For a professional insulation inspection, repair and replacement give us a call at Green Comfort Solutions. We’re happy to make the appropriate recommendations for your home to make it a more efficient and comfortable place for you and your family. Call us or click here for a quote!